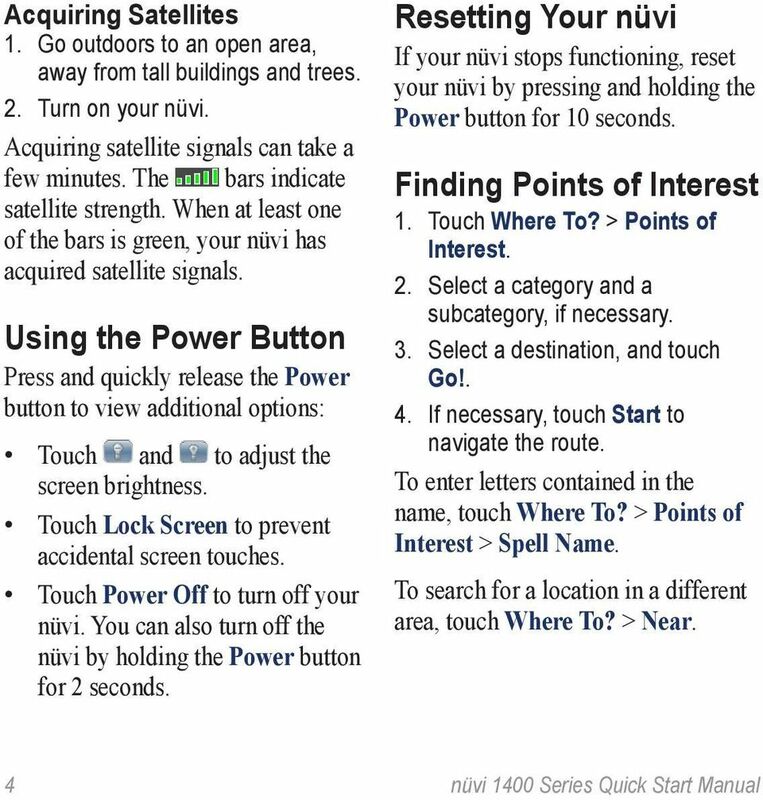 Download "nüvi 1400 series quick start manual"
2 Looking at Your nüvi See the Important Safety and Product Information guide in the product box for product warnings and other important information. Power button: Press to turn the nüvi on and off. 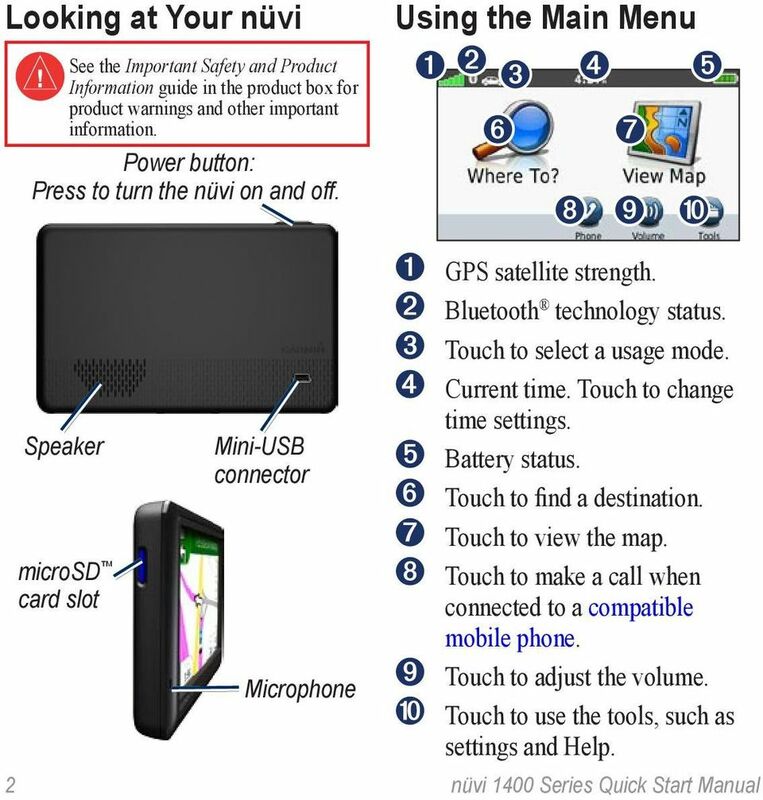 Using the Main Menu ➊ ➋ ➌ ➍ ➎ ➏ ➐ ➑ ➒ ➓ Speaker microsd card slot Mini-USB connector Microphone ➊ GPS satellite strength. ➋ Bluetooth technology status. ➌ Touch to select a usage mode. ➍ Current time. Touch to change time settings. ➎ Battery status. ➏ Touch to find a destination. ➐ Touch to view the map. ➑ Touch to make a call when connected to a compatible mobile phone. ➒ Touch to adjust the volume. ➓ Touch to use the tools, such as settings and Help. 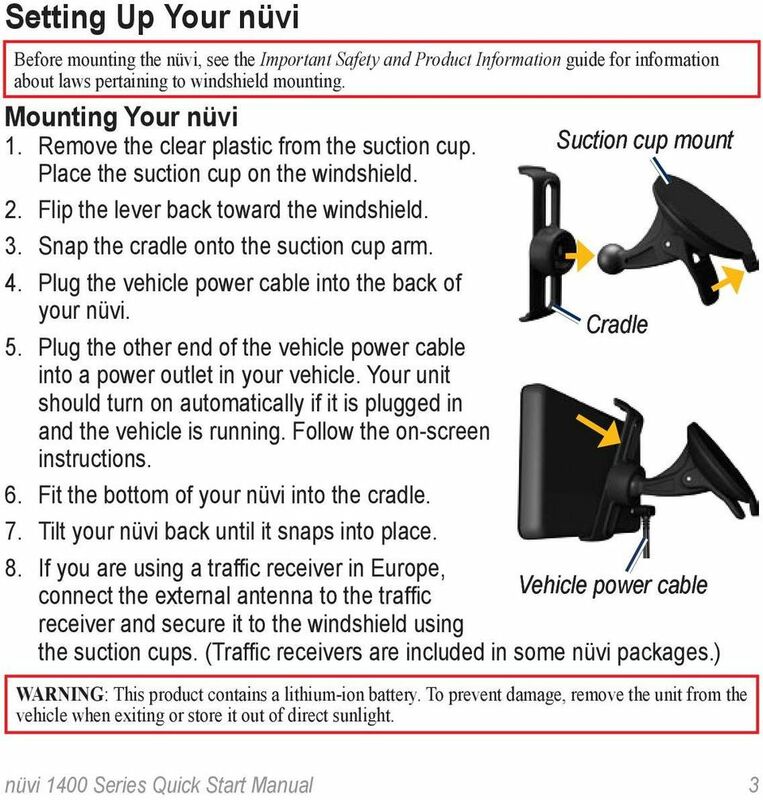 3 Setting Up Your nüvi Before mounting the nüvi, see the Important Safety and Product Information guide for information about laws pertaining to windshield mounting. Mounting Your nüvi 1. Remove the clear plastic from the suction cup. Suction cup mount Place the suction cup on the windshield. 2. Flip the lever back toward the windshield. 3. Snap the cradle onto the suction cup arm. 4. Plug the vehicle power cable into the back of your nüvi. Cradle 5. Plug the other end of the vehicle power cable into a power outlet in your vehicle. Your unit should turn on automatically if it is plugged in and the vehicle is running. Follow the on-screen instructions. 6. Fit the bottom of your nüvi into the cradle. 7. Tilt your nüvi back until it snaps into place. 8. If you are using a traffic receiver in Europe, connect the external antenna to the traffic Vehicle power cable receiver and secure it to the windshield using the suction cups. (Traffic receivers are included in some nüvi packages.) Warning: This product contains a lithium-ion battery. To prevent damage, remove the unit from the vehicle when exiting or store it out of direct sunlight. 5 Following Your Route Your route is marked with a magenta line. As you travel, your nüvi guides you to your destination with voice prompts, arrows on the map, and directions at the top of the map. If you depart from the original route, your nüvi recalculates the route. Touch and drag the map to view a different area of the map. A speed limit icon could appear as you travel on major roadways. ➊ ➋ ➍ ➌ ➎ ➏ ➐ ➊ Touch to view the Next Turn page. ➋ Touch to view the Turn List page. ➌ Touch to view the Where Am I? page. ➍ Touch and to zoom in and out. ➎ Touch to return to the Main menu. ➏ Touch to change the data field. ➐ Touch to view the Trip Computer. Adding a Stop 1. 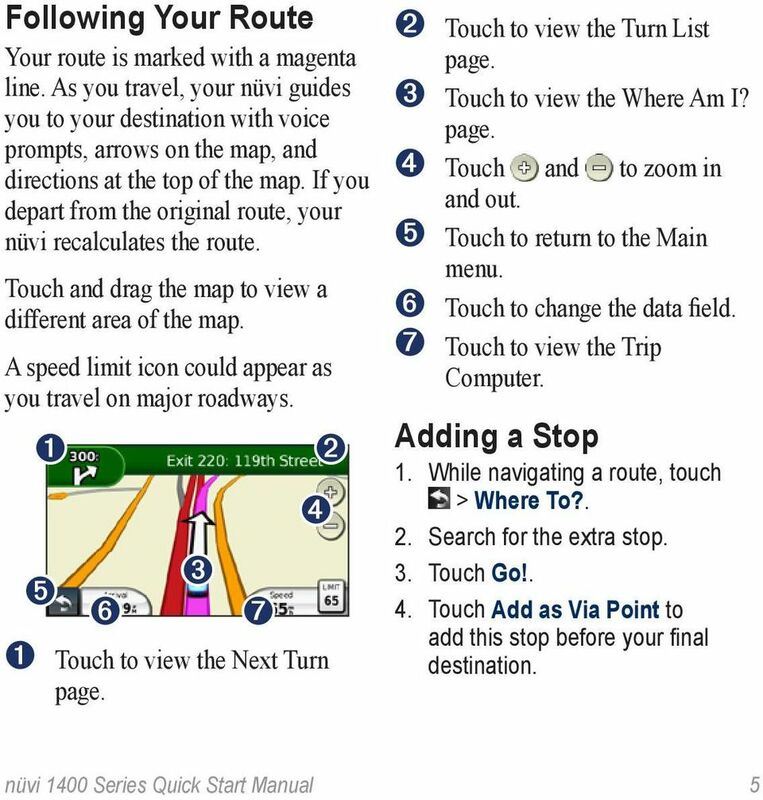 While navigating a route, touch > Where To?. 2. Search for the extra stop. 3. Touch Go!. 4. Touch Add as Via Point to add this stop before your final destination. 6 Taking a Detour 1. While navigating a route, touch. 2. Touch. 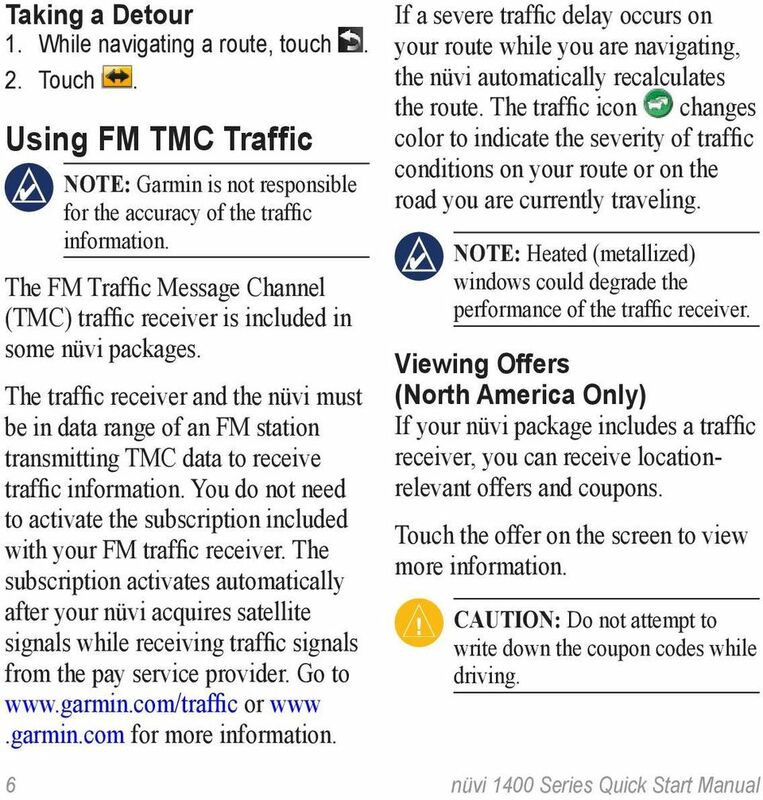 Using FM TMC Traffic Note: Garmin is not responsible for the accuracy of the traffic information. The FM Traffic Message Channel (TMC) traffic receiver is included in some nüvi packages. The traffic receiver and the nüvi must be in data range of an FM station transmitting TMC data to receive traffic information. You do not need to activate the subscription included with your FM traffic receiver. The subscription activates automatically after your nüvi acquires satellite signals while receiving traffic signals from the pay service provider. Go to or for more information. If a severe traffic delay occurs on your route while you are navigating, the nüvi automatically recalculates the route. The traffic icon changes color to indicate the severity of traffic conditions on your route or on the road you are currently traveling. Note: Heated (metallized) windows could degrade the performance of the traffic receiver. Viewing Offers (North America Only) If your nüvi package includes a traffic receiver, you can receive locationrelevant offers and coupons. Touch the offer on the screen to view more information. caution: Do not attempt to write down the coupon codes while driving. 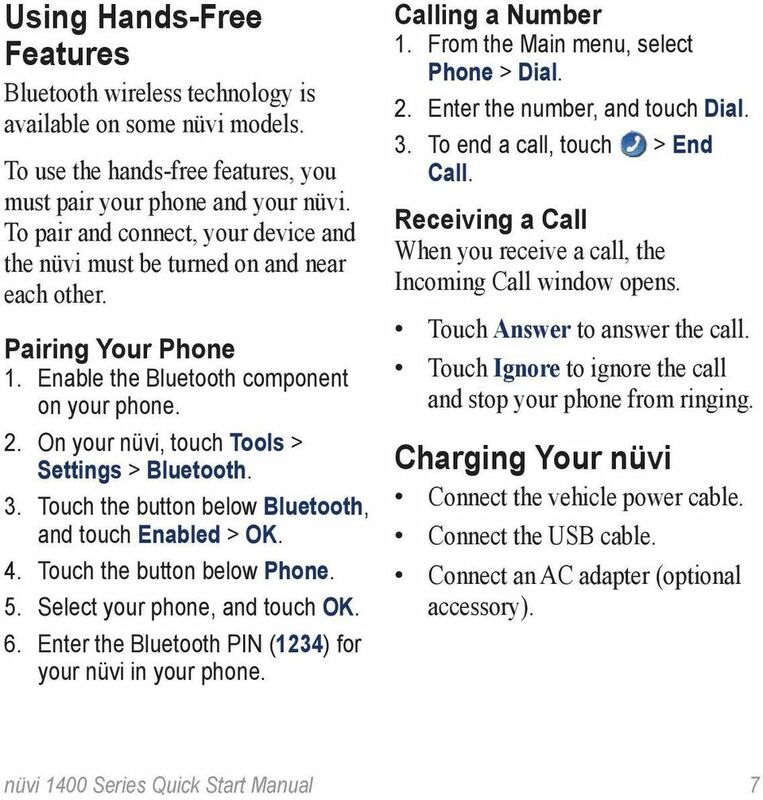 7 Using Hands-Free Features Bluetooth wireless technology is available on some nüvi models. To use the hands-free features, you must pair your phone and your nüvi. To pair and connect, your device and the nüvi must be turned on and near each other. Pairing Your Phone 1. Enable the Bluetooth component on your phone. 2. On your nüvi, touch Tools > Settings > Bluetooth. 3. Touch the button below Bluetooth, and touch Enabled > OK. 4. Touch the button below Phone. 5. Select your phone, and touch OK. 6. Enter the Bluetooth PIN (1234) for your nüvi in your phone. Calling a Number 1. From the Main menu, select Phone > Dial. 2. Enter the number, and touch Dial. 3. To end a call, touch > End Call. Receiving a Call When you receive a call, the Incoming Call window opens. Touch Answer to answer the call. Touch Ignore to ignore the call and stop your phone from ringing. Charging Your nüvi Connect the vehicle power cable. Connect the USB cable. Connect an AC adapter (optional accessory). 8 Securing Your nüvi 1. Ensure that you are at your security location and that your nüvi is receiving satellite signals. 2. Touch Tools > Settings > Security. 3. Touch the button below Garmin Lock. 4. Enter a four-digit PIN. 5. Touch Set. 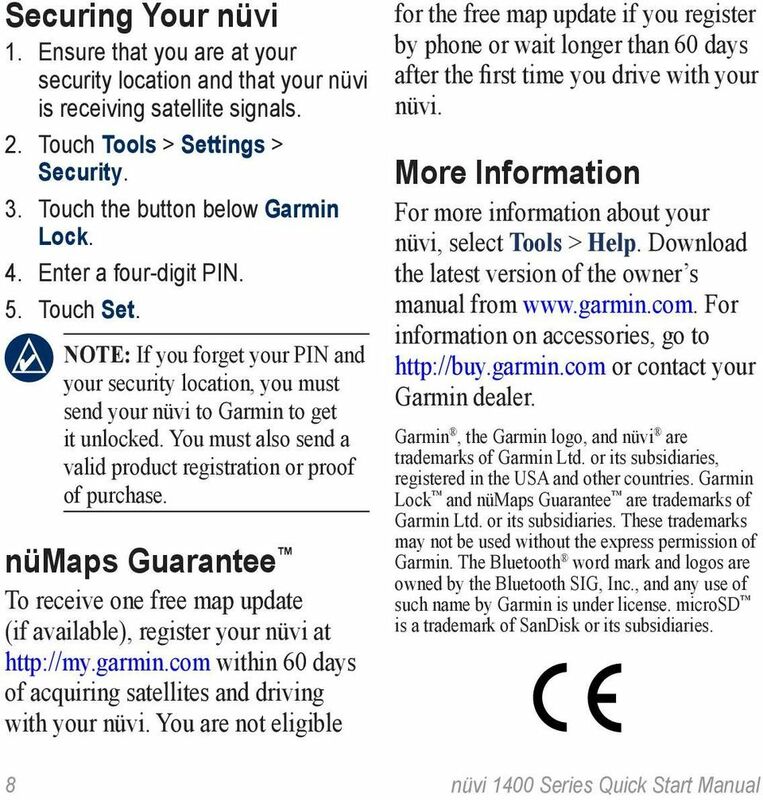 NOTE: If you forget your PIN and your security location, you must send your nüvi to Garmin to get it unlocked. You must also send a valid product registration or proof of purchase. nümaps Guarantee To receive one free map update (if available), register your nüvi at within 60 days of acquiring satellites and driving with your nüvi. You are not eligible for the free map update if you register by phone or wait longer than 60 days after the first time you drive with your nüvi. More Information For more information about your nüvi, select Tools > Help. Download the latest version of the owner s manual from For information on accessories, go to or contact your Garmin dealer. Garmin, the Garmin logo, and nüvi are trademarks of Garmin Ltd. or its subsidiaries, registered in the USA and other countries. 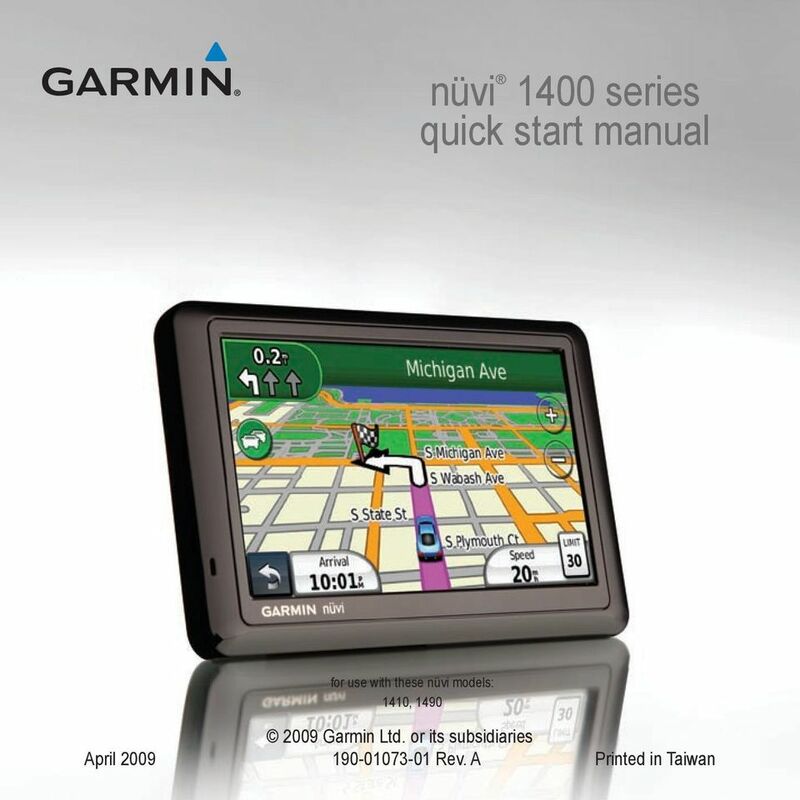 Garmin Lock and nümaps Guarantee are trademarks of Garmin Ltd. or its subsidiaries. These trademarks may not be used without the express permission of Garmin. The Bluetooth word mark and logos are owned by the Bluetooth SIG, Inc., and any use of such name by Garmin is under license. microsd is a trademark of SanDisk or its subsidiaries. Android Auto. Quick Start Guide QR CODE. UVO eservices with Premium Navigation. Welcome! Note: Available applications and services are subject to change at any time. Iridium GO! This device must be turned off at all times while on board aircraft. The device may be used by the pilot or with the pilot s consent (US Code of Federal Regulation (CFR): 47 C.F.R. 25.285). A user can also attempt to get their current Location within the navigation software to refresh your GPS by going to Share & More > Record Location.